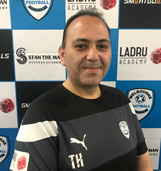 Between the ages of 10 - 18 years, Tony played and developed his football tuition in Victorias State Leagues with Northcote City. In 1988 at the age of 18 years Tony suffered a career ending ankle injury which effectively forced him to retire from football immediately. Still having the passion and the burning desire for the game Tony turned to coaching football and Futsal. His passion for the game is second to none and Tony's eagerness to learn from others is evident. Having a number of setbacks with a number of sporting injuries Tony re-evaluated his life goals and has since devoted his time and efforts into coaching and educating young footballers to their true potential.